DIE Mercurii, 22 die Junii. Earl of Exeter to put the Rutland Militia in Execution. Letter from Ld. Willough- of Parham. Bill for the Adventure for Ireland passed by Commission. Reward for the Officers who have the Care of them to be considered. Three Irish Prisoners to be dieted by the Lieutenant of The Tower; and he to be allowed for them. Message to the H. C. for a Conference. Subject of it. Philips sent for, for Words against the Parliament. Lord Balmarino versus Justice Heath. Lord Willoughby's Letter to the Speaker, about the Lincolnshire Militia. The Declaration of the County of Lincoln. Ordered, That the Earl of Exon, Lord Lieutenant for the County of Rutland, shall put the Militia into Execution on the Seventh Day of July next; and the Instructions concerning bringing in Plate and Money are to be put into Execution by the Deputy Lieutenants of that County. A Letter from the Lord Willoughby of Parham was read, directed to the Speaker. Ordered, That a Letter shall be sent to the Lord Willoughby, to give him Thanks for his good Service he hath done concerning the Militia. 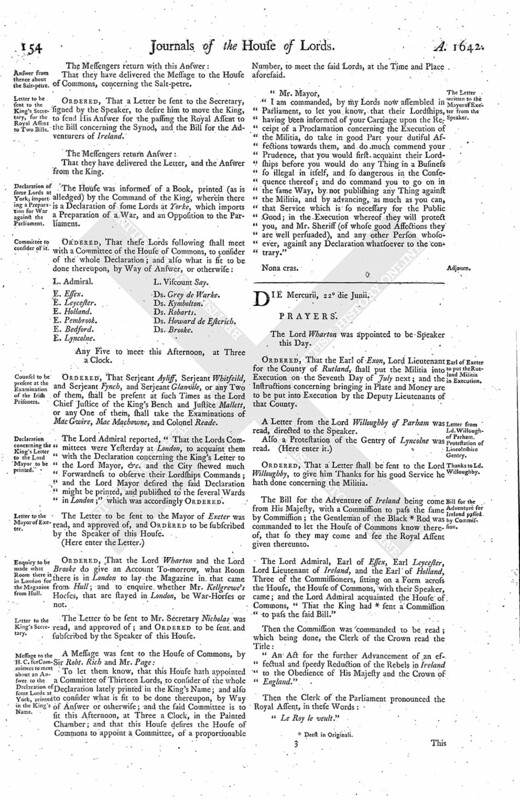 The Bill for the Adventure of Ireland being come from His Majesty, with a Commission to pass the same by Commission; the Gentleman of the Black (fn. 1) Rod was commanded to let the House of Commons know thereof, that so they may come and see the Royal Assent given thereunto. The Lord Admiral, Earl of Essex, Earl Leycester, Lord Lieutenant of Ireland, and the Earl of Holland, Three of the Commissioners, sitting on a Form across the House, the House of Commons, with their Speaker, came; and the Lord Admiral acquainted the House of Commons, "That the King had (fn. 1) sent a Commission to pass the said Bill." "An Act for the further Advancement of an effectual and speedy Reduction of the Rebels in Ireland to the Obedience of His Majesty and the Crown of England." This being done, the House of Commons went, with their Speaker, to their House. 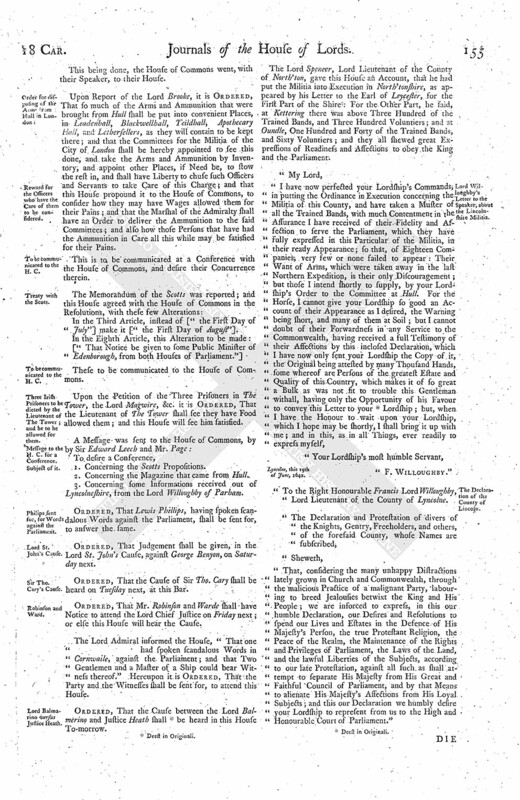 Upon Report of the Lord Brooke, it is Ordered, That so much of the Arms and Ammunition that were brought from Hull shall be put into convenient Places, in Leadenhall, Blackwellhall, Yeildhall, Apothecary Hall, and Lethersellers, as they will contain to be kept there; and that the Committees for the Militia of the City of London shall be hereby appointed to see this done, and take the Arms and Ammunition by Inventory, and appoint other Places, if Need be, to stow the rest in, and shall have Liberty to chuse such Officers and Servants to take Care of this Charge; and that this House propound it to the House of Commons, to consider how they may have Wages allowed them for their Pains; and that the Marshal of the Admiralty shall have an Order to deliver the Ammunition to the said Committees; and also how those Persons that have had the Ammunition in Care all this while may be satisfied for their Pains. This is to be communicated at a Conference with the House of Commons, and desire their Concurrence therein. In the Third Article, instead of ["the First Day of July"] make it ["the First Day of August']. These to be communicated to the House of Commons. Upon the Petition of the Three Prisoners in The Tower, the Lord Magwire, &c. it is Ordered, That the Lieutenant of The Tower shall see they have Food allowed them; and this House will see him satisfied. 1. Concerning the Scotts Propositions. 2. Concerning the Magazine that came from Hull. 3. Concerning some Informations received out of Lyncolneshire, from the Lord Willoughby of Parham. Ordered, That Lewis Phillips, having spoken scandalous Words against the Parliament, shall be sent for, to answer the same. Ordered, That Judgement shall be given, in the Lord St. John's Cause, against George Benyon, on Saturday next. Ordered, That the Cause of Sir Tho. Cary shall be heard on Tuesday next, at this Bar. Ordered, That Mr. Robinson and Warde shall have Notice to attend the Lord Chief Justice on Friday next; or else this House will hear the Cause. The Lord Admiral informed the House, "That one had spoken scandalous Words in Cornwaile, against the Parliament; and that Two Gentlemen and a Master of a Ship could bear Witness thereof." Hereupon it is Ordered, That the Party and the Witnesses shall be sent for, to attend this House. Ordered, That the Cause between the Lord Balmerino and Justice Heath shall (fn. 2) be heard in this House To-morrow. The Lord Spencer, Lord Lieutenant of the County of North'ton, gave this House an Account, that he had put the Militia into Execution in North'tonshire, as appeared by his Letter to the Earl of Leycester, for the First Part of the Shire: For the Other Part, he said, at Kettering there was above Three Hundred of the Trained Bands, and Three Hundred Voluntiers; and at Oundle, One Hundred and Forty of the Trained Bands, and Sixty Voluntiers; and they all shewed great Expressions of Readiness and Affections to obey the King and the Parliament. Lyncolne, this 19th of June, 1642. "To the Right Honourable Francis Lord Willoughby, Lord Lieutenant of the County of Lyncolne. "That, considering the many unhappy Distractions lately grown in Church and Commonwealth, through the malicious Practice of a malignant Party, labouring to breed Jealousies betwixt the King and His People; we are inforced to express, in this our humble Declaration, our Desires and Resolutions to spend our Lives and Estates in the Defence of His Majesty's Person, the true Protestant Religion, the Peace of the Realm, the Maintenance of the Rights and Privileges of Parliament, the Laws of the Land, and the lawful Liberties of the Subjects, according to our late Protestation, against all such as shall attempt to separate His Majesty from His Great and Faithful Council of Parliament, and by that Means to alienate His Majesty's Affections from His Loyal Subjects; and this our Declaration we humbly desire your Lordship to represent from us to the High and Honourable Court of Parliament."